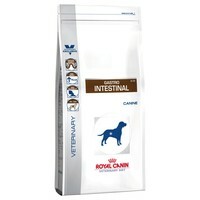 Royal Canin Gastro Intestinal Dry Food for Dogs is a nutritionally complete veterinary diet for dogs with acute and chronic digestive disorders, to promote nutritional restoration and convalescence. Chronic Diarrhoea, Inflammatory Bowel Disease (IBD), Maldigestion. Malabsorption, Re-feeding after Surgery, Small Intestinal Bacterial Overgrowth (SIBO), Exocrine Pancreatic Insufficiency (EPI), Gastritis, Colitis, Inappetence. My 15 year old labrador, who has a very sensitive tummy and has to be careful about what she eats, absolutely loves this food, which was recommended to us by her vet. It costs about £30 a bag more from the vet so I was really pleased when I saw that VetUK sold it. My dog has to be on a singular diet. After trying Hills and Purinas versions we found that he only likes this one. Since then we have had no problems, his fur looks healther and he is much more active. As we also use it as a treat when out walking we found that all other dogs love it too! Suits my dogs & they thrive on it as I have to be careful what they are fed on.